WHY: Tons of stuff starting at $1 at the Shop Jeen Sample Sale. Shop brands such as Wildfox, Cheap Monday, Vanessa Mooney, Verameat, Chris Habana, Tokidoki, Ksubi, In God We Trust, Melody Ehsani, Dimepiece, Dannijo, Mara Hoffman, HUF, Jeremy Scott, Made in HELLA, Beach Riot and many more. Deal: Up to 80% off retail prices on menswear. Jackets are $150 to $400 (from up to $2,500), suits are $200 to $800 (from up to $3,500), shirts are $60 to $90 (from $150-$400), sweaters are $60 to $160 (from $180-$380), pants are $80 to $120 (from $240-$450), polo shirts are $55 (from up to $130), ties are $45 (from up to $140), shoes are $120-$150 (from $340-$580). Full suits also available. 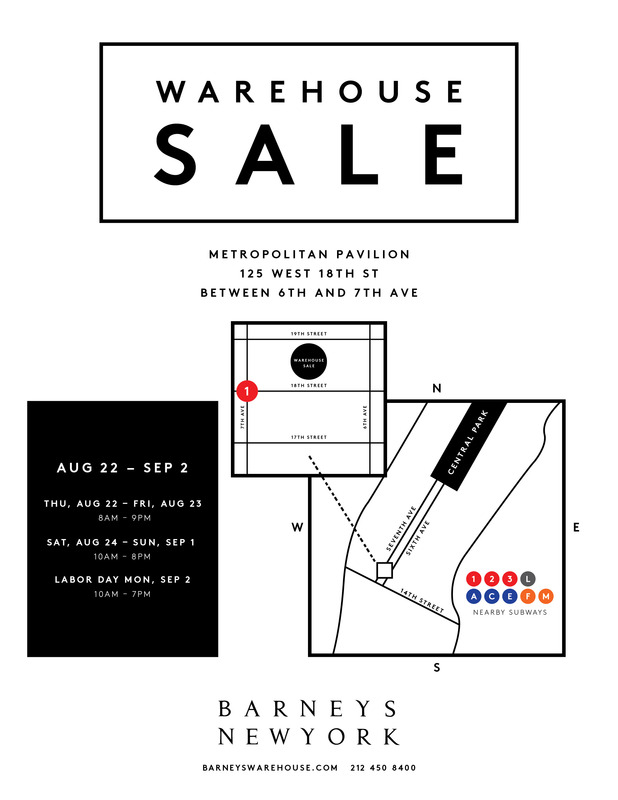 WHY: Women’s and men’s clothing at a discount at the JACHS Spring/Summer 2013 sample sale. Effortless, American clothing for everyday wear including women’s shirts, dresses, tunics, bottoms, denim vests and jackets and men’s shirts, non-denim pants, knits, polos, varsity jackets. JACHS is every shopper’s one-stop-shop for casual, American Vintage-inspired clothing. JACHS uses premium fabrics for the utmost comfort and style. Perfect for any occasion that requires a laidback look, JACHS has everything from the perfect button down shirt to leather bomber jackets and belted shirt-dresses. Deal: 40% to 80% off handmade, fair-trade scarves and jewelry. Deal: 60%—85% off womenswear from Spring/Summer 2013 Fall/Winter 2012. Includes Red Crushed Satin Twill Plunge Tee & Pant for $200/$300 (from $825/$1095), Ice Asymmetrical Bias Dress priced for $400 (from $2,250), Ormolu Print Silk Faille Seamed Keyhole Dress for $425 (from $2,450), Wide Leg trousers for $200 (from $825), and gowns from $700. Deal: Up to 80% off past seasons collections. Prices run from $100 to $3,000 and sizes range from 2 to 16. Deal: 30% to 80% off selected merchandise, including Some Odd Rubies archived vintage pieces and the Lindsey Thornburg spring/summer 2013 collection, cloak samples, and backstock. A wide selection of designer gowns will be discounted up to 70% off. Prices on accessories will start at $99. Deal: Celebrity stylist Jason Bolden is curating this year’s Society of Memorial Sloan-Kettering Cancer Center Thrift Shop fall opening, where designer and vintage goods will be marked down. Brands include Judith Leiber, Manolo Blahnik, Balmain, Carolina Herrera, and more. All proceeds from the thrift shop benefit the SMSKCC Thrift Shop. Deal: Deep discounts on men’s and women’s merchandise. Prices start at $10, and nothing is over $40. Deal: 40% to 70% off women’s ready-to-wear. The Citrine dress and the Desert dress are each $155 (were $258), the Fiore dress is $173 (was $288), the Brass dress is $113 (was $188), and the Pelican dress is $77 (was $128). The sale will also take place online. Deal: Up to 70% off retail prices on handbags, clutches, and accessories. Sydney totes are $225 (from $525), Mini Marlow denim and camel clutches are $175 (from $325), and the Vivi Coral Shimmer Croco clutch is $125 (from $295). New small leather goods start at $15, and items in the bargain boxes start at $20. Deal: Up to 85% off retail prices on menswear and womenswear. Women’s brands include Rag & Bone, Helmut Lang, IRO, Alice and Olivia, Phillip Lim, Roberto Cavalli, Current Elliot, Alexander Wang, Ved, SEA, and Pierre Balmain. Men’s brands include Gant by Michael Bastian, Paul Smith, Rag and Bone, Dsquared, John Varvatos, Martin Margiela and Etro. Deal: Up to 75% off retail prices on menswear. Shirts are $45-$80, shoes are $100-$150, trousers are $50, knits are $30-$60, blazers are $120-$175, and jackets are $80-$150. Deal: Up to 70% off lingerie, clothing, swimwear, and accessories. Cosabella lace underwire bras are $34 (were $85), and an Acacia crocheted bikini set is $108 (was $215). Deal: 60% to 90% off menswear, womenswear and accessories at this multi-designer sale. The sale will include Soulland, Risto, In God We Trust, Samantha Pleet, Upstate, Atelier Nunu, Creatures of Comfort, and roughly 75 other designers. Merchandise will range from spring/summer clearance, past collections, and designer samples and experiments. When/Where: Friday, August 16 through Sunday, August 18. Daily 11am—6pm. Swords-Smith, 98 S. 4th St between Berry and Bedford Aves (347-599-2969). Deal: Markdowns on women’s jewelry. The minimum purchase for credit cards is $100. Deal: Up to 70% off retail prices on jewelry. The Alexis Bittar Cordova Necklace is $495 (from $995), the Dannijo Tullia Necklace is $447 (from $745), the Jules Smith Viva Glam Cuff is $40 (from $100), the Lulu Frost Immortality Necklace is $170 (from $285), and the Tom Binns Electric Color Earrings is $225 (from $375). Deal: Up to 80% off retail prices for womenswear. Deal: Up to 75% off retail prices on cuffs, bangles, and clutch handbags. Deal: Markdowns on womenswear. The spring/summer 2013 collection is priced from $50 to $75, fall samples are $50, and older merchandise is $25. Deal: 70% off retail prices for accessories. Deal: 35% to 50% off retail prices for sample bridal gowns. Prices range from $495 to $1,495. Designers include Vera Wang, Ulla Maija, Junko Yoshioka, Angel Sanchez and Lela Rose. Proceeds benefit education for disadvantaged children in NYC. By appointment only. Étoile Isabel Marant jean jacket priced at $119.